Visit my Science Solutions blog page. The image to the right shows everything that we have learned about the outside of the eye. For example the pupil and the sclera. The external basicly just shows everything that are outside of the human eye. I fthere is a mirror or person nearby just look at the outside and try to point out what is the chart and what is on their eye. You will see they may or may not have different eye color than the image tom the right , but that they have the same parts of the eye as the digram. We use Punnett squares to predict the percentage of a chance with specific traits. 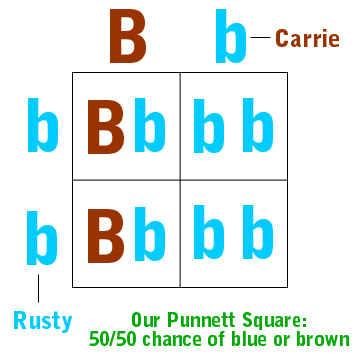 For example, to the right there is a Punnett square showing the percentage of Carrie and Rusty having children with blue or brown eyes. The way you can find out the future trait of an offspring is by having a dominant and recessive trait. Once you do that put it into a Punnett square like the one shown to the right. For you to find out the percentage of the offspring's trait you have to know that a big letter with a big or big with a little letter is the dominant trait you chose. The two little letters represent the recessive trait. Like the example Carrie and Rusty are able to see that they had a 50/50 chance of having a blue or brown eyed child. There is six characteristics that explain what a living thing has. If the organism contains all that a living thing is soppose to have its a living thing. For example, one of the things thay a living thing contains is cells, They response to change things like that. If you look to the right there is my glogster poster. As you can see or read there is info on what living things have to have to have to prove they are a living thing. Of course you are a living thing organism and so is your whole family. Visit https://edu.glogster.com/ to make a poster like this.